From their brewery high in the Southern Alps of New Zealand, the team at Cargo Brewery are proud to share this beer with you. Brewing with New Zealand hops and grains and an honest drop of some of the purest water on the planet, Cargo Brewery wishes you good health. Sláinte. In a matter of seconds, packaging can inspire a customer to buy your product or not. Therefore, we focus on the ’essential’, eliminating the rest. We do not put the focus on reducing, we put the focus on what is important through an ‘authentic’ and ‘genderless’ design. Our differential advantage is that the front of the label is on one side of the bottle. This challenges the natural order and generates an ‘equilibrium’ between these two opposing forces. We try to break the ‘gender stereotypes’ linked to the beers with a gender-neutral packaging, not only to open the scope of the business, but also to encourage gender equality. 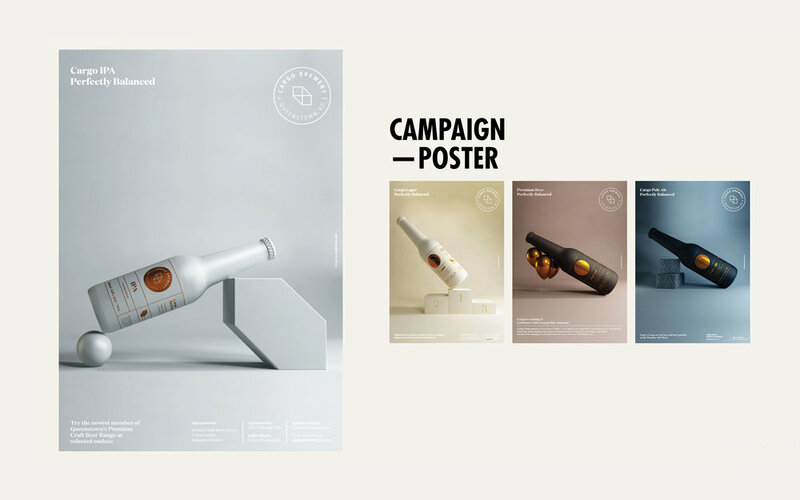 The brands that have limited commercial support highly depend on the power of their packaging to be able to attract the consumer, so the packaging not only should be based on visible impact, but it should create emotion. We try to create a simple, clear and empathetic message on our packs. For us the design of these products must have an honest attitude and tell the consumer what they are really buying. We focus on clarity of message and on creating an emotional state in the viewer that is fulfilled and satisfied. Happiness is an essential element for us to keep the freshness in our designs. We try to clarify not simplify our designs with a solution that is not only clever, it must be relevant.